Papercrafts by Patti: Olive Birthday & Special Offer--Freebies! Olive Birthday & Special Offer--Freebies! Another Birthday card? Are you surprised? I can't help it, I've got Birthday on the brain! You can never have too many birthday cards made up ahead of time for that part of the year where time escapes you and you forgot to plan ahead. See you how you can get this FREE below!! Actually, I am using my Stampin' Up! 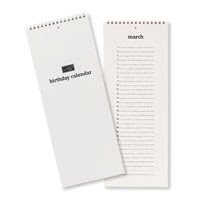 Whisper White Birthday Calendar (101398 $7.95) that you fill in yourself (after you decorate it with stamps, of course!) to keep ahead of the game for 2010. Each person's birthday is written on the appropriate year, and you just refer to it to remind you when birthdays are coming up. I make the cards and put them into envelopes to address and sign at the appropriate time. My SPECIAL PROMOTION: Place an order of $50 or more through my Demonstrator Website From January 30th to February 15th, and I will send you a **FREE** Whisper White Birthday Calendar! It's simple. 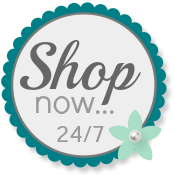 Just click on the SHOP STAMPIN' UP 24/7 button on my right sidebar, place your order and I will send you a free calendar. Also, you will earn one Sale-A-Bration item FREE for each $50 you spend. (Orders on my Website only and US ORDERS ONLY). I really like the contrast of the old olive and white - I always use cream........hmmm thanks for the new idea! Patti this is wonderful!!! I LOVE the green and white wonderful birthday card! love all these winter-themed bday cards!!! You can't beat Old Olive! What a striking combo with the white!